Therefore. Because. For R.D. 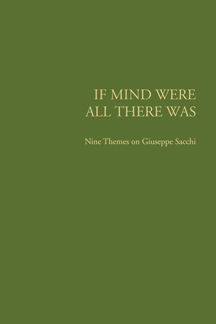 Laing is a diagrammatic fiction in If Mind Were All There Was: Nine Themes on Giuseppe Sacchi, a new artists book conceived by Victor Man. The book is a collection of texts inspired by Giuseppe Sacchi, a 17th Century Italian painter of portraits and historical subjects, who gave up art to become a Franciscan monk, and died young. No evidence of his work or further biography exists. In the Basilica di San Francesco in Arezzo, Tuscany, a horse depicted in Piero della Francesca’s famous cycle of frescos The Legend of the True Cross (completed in 1466) bears Giuseppe Sacchi’s name on its forehead, a piece of graffiti added at an unknown date, and by unknown hands. Nine art critics, curators, writers and artists have been invited to shape a possible biography, so as to reconsider the limits and possibilities of art writing. Contributors include: Maria Fusco, Massimiliano Gioni, Martin Herbert, Francesco Manacorda, Tom Morton, Alessandro Rabottini, João Ribas, Torsten Slama and Martin Vincent.